Home > Tips > Cat Tail Language: What Is Kitty Trying to “Tail” You? Alright, cat lovers. Who has ever wished they were like Eliza Thornberry so they could actually speak to animals? (Me! Oh, pick me!) That’s what I thought. Unfortunately, the magical Shaman Mynambo isn’t around to grant us the gift of communicating with animals. But no worries, there are ways to translating what your cat is trying to tell you. Just follow T.A.I.L! Here are some brief descriptions of the 9 different positions of cat tail language. Try and identify which one your kitty is doing! A tail that sticks straight up signals happiness and a willingness to be friendly; your cat is alert and confident! Sometimes the tip of an erect tail will make a quick, little twitch which can mean a particularly happy moment. This tail position often signals a loving, playful mood and a cat that’s ready to share some fun with you, so get out the toys and string! Sometimes your cat will see a bird outside the window, in addition to making funny noises, usually s/he will be slowly swishing their tail. This means they are most likely focused on an object and are very interested or curious. This one tail position means you are doing something right for your kitty. 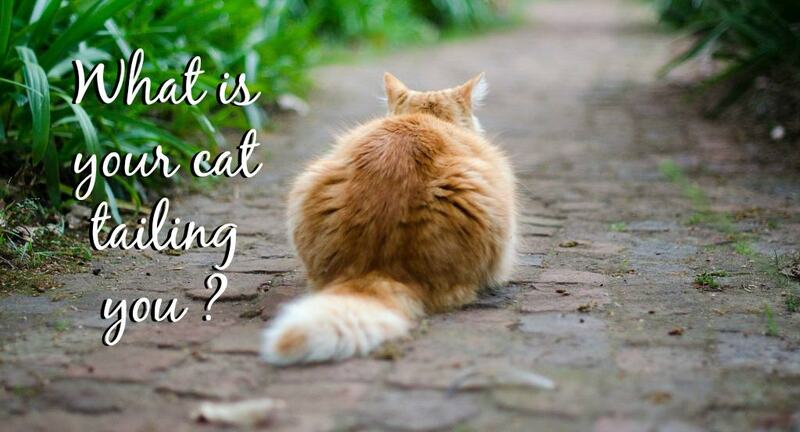 A quivering or vibrating-looking tail means your cat is excited and very happy! Often when we are playing with Yoda (he loves to be chased and play hide and seek), his tail will be pointing high in the air like flagpole position, but will jolt, flicker, or quiver slightly. It took me a while to notice it, but when I did I was thrilled myself! A cat that is relaxed or feeling good will have their tail in a natural position. A slow swish shows they’re comfy and interested. Uh oh! Watch out for your feet when you walk! A tail positioned straight down can signal aggression. A lower tail indicates your cat is in a very serious mood. A tail curved beneath the body signals fear or submission. Something is making your cat nervous and you should try to soothe him by sniffing out the scary source. One time, Yoda was chasing my sister’s little dog when he barked at Yoda and all of a sudden Yoda’s tail became three times the size of its normal fluffiness. His tail was all spiked out and frizzy looking! 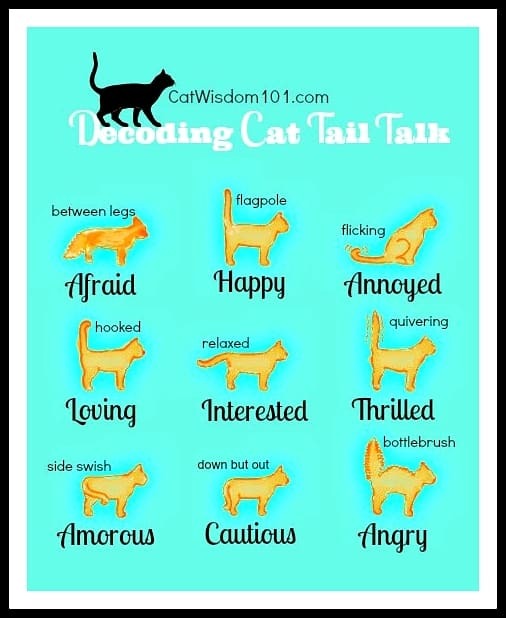 Cat tail language can be tricky to understand but we hope now it will be easier for you to get a sense of what your cat is trying to tell you, or at least what kind of emotion or mood s/he is in! 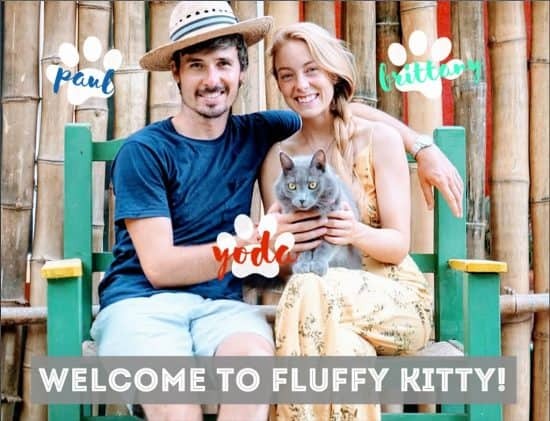 We thank you for following us on Fluffy Kitty! Stay in touch for new articles and follow us on Facebook, Google+, Twitter and now Instagram! My concern is that my cat will not let me touch her or pick her up. I have had her now for ll months and she was ll months old when I got her. She is rather large black and white cat with a very long fluffy tail (almost as long as her body!) She was born and raised at a shelter and had severe siblings. She was last of her family to be adopted. She seems heathy, eats well, likes to be in rooms with me and sleep in BR with me…under the bed usually or at my feet. Yesterday,however, she peed on the bed in area where I sleep! WHY? Will she ever let me pet her, pick her up, come to my lap or “cuddle” with her? Is peeing on the bed the beginning of another problem even though litter box is cleaned daily and always available? Hi Mary, thanks for reaching out to us! It sounds like your kitty might be a little lonely and this could be why she’s acting out. She had fur-iends around her as a young kitten and maybe she is missing kitty contact. Does she seem aggressive when you go to cuddle her? Or is she just disinterested? Have you tried all the classics, like calling her and rewarding her with treats when she takes it from your hands? Playing with her minimum 15 minutes a day? Creating a special bond with a cat can vary from owner to owner, some cats just don’t like to be cuddled as much as others and this will depend lots on the cat’s purrsonality, too. If she’s peeing on your bed in the spot where you sleep, it’s usually a big indicator that something’s up or she was recently uncomfortable, unhappy, bored, mad, and is feeling vengeful. We write about why cats pee on beds here in our article. You should read through it and see if any of it applies to you and your fluffy kitty. Thanks and we wish you the best moving forward!